Today we will be diving into how one can add GLAccount to Chart of Accounts (CoA) in OFBiz using UI tools. Before you try the steps listed in this OFBiz tutorial, make sure you have a user account with Account Manager role assigned to it. Go to the “Accounting Manager” application and click on the “Global GL Settings ” menu and then select “Chart of Accounts”, Existing GLAccount list will be shown. A user can add a New GLAccount to CoA by clicking on the Navigate Accounts tab. The screen shows CoA in a tree structure. The bottom part of the screen has a form for adding and editing GLAccount. Fill in the required information for the new GLAccount, click on the “Add” button to add the GLAccount to your CoA. 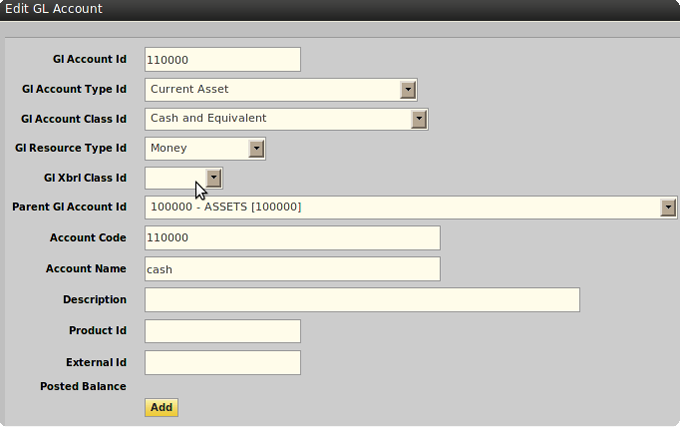 The new GlAccount will be added in Chart of Accounts, you can view it in the CoA tree. Moving towards the Next Step which is editing GLAccount, Select GLAccount from CoA tree, GLAccount will be available for editing in edit form below the tree. Make necessary changes and save. Stay tuned with the OFBiz tutorial to get more examples for your own Business Domain.